As a child you visited your Grandfather's ranch when vacation plans fell through. Return to the farm that holds fond childhood memories and rejuvenate it's (sic) long neglected fields. Tend to your livestock and interact with over 50 characters. As you struggle to make the farm something your grandfather would be proud of, one nagging question remains: what ever happened to the little girl that you knew a decade ago? Compete with Villagers in challenging festival mini contests. Add a kitchen and collect recipies. Women love a man who can cook! Source: Wikipedia, "http://en.wikipedia.org/wiki/Harvest_Moon:_Back_to_Nature," available under the [ http://creativecommons.org/licenses/by-sa/3.0/ CC-BY-SA License]. Harvest Moon: Back to Nature is a video game in the farm simulation series Harvest Moon, developed by Victor Interactive Software. 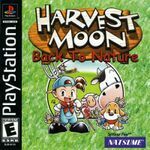 It is the only Harvest Moon game developed for the PlayStation, as well as the first Harvest Moon game for a non-Nintendo console. Characters from Harvest Moon 64 were transferred to be the characters in this game, although with new lifestyles, personalities, and relatives, including the wooable girls from Harvest Moon 64 (Ann, Elli, Popuri, Maria [known as Mary], and Karen).